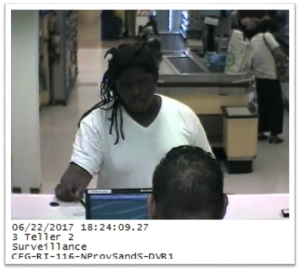 On 06/22/17, the male depicted in the photograph, deposited a fraudulent check for approximately $11,000 at a Citizen’s Bank branch in North Providence. Members of the North Providence Police, Detective Division, are seeking the public’s assistance to help identify this male. If you have any information regarding this investigation please contact Det. Luis Rivera at (401)231-4533 Ext. 135. Thank you for your assistance.